If Gentec choosed Omnicure as a partner, it’s because the brand has been a pioneer in polymerization for more than 30 years. Since Omnicure is the leader on the market, it is constantly innovating. Omnicure products offer the possibility to work via punctual sources or surfaces. With surface sources, it is possible to cure a large surface in a very short time. Punctual surfaces, on the other hand, allow for more precision and thoroughness to cure small and very small area. There are two technologies that allow to obtain ultraviolet: ARC lamp and LED light. With their investments in R&D, the company holds several patents, including the “close loop feedback” technology which allows a compensation of the aging of the lamp in order to maintain a constant intensity. 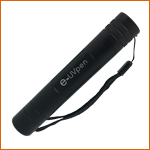 Arc lamps can develop forces up to 24.7 W/cm². LED lights have a lifespan of 20 000 hours and can develop forces up to 16 W/cm². In order to be the most effective possible, Omnicure also offers measurement instruments which aim is to maintain a repetitive process. How do I choose between Arc lamps and LED lights? Each application is different, our experts can help you to find the most appropriate technology for your specific need. Please do not hesitate to contact us if you need further information. 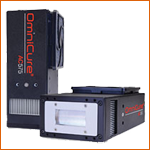 UV curing systems that provide leading manufacturers worldwide with the most advanced, simple-to-use and reliable UV curing technology. 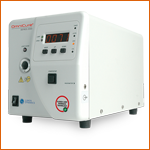 OmniCure AC Series UV LED curing systems offer high power, superior air-cooled performance and maximum integration flexibility to best fit the needs of both small and wide area curing applications.